Looking to stay connected to the latest industry news, learn from some of the nation’s greatest healthcare and interoperability experts, and connect with your peers? DirectTrust is proud to host our first in-person meeting, featuring a keynote speaker, two panels, and a breakout session coinciding with our June All Members Meeting. This event is open to both members and non-members of DirectTrust. During the All Members Meeting, non-members of DirectTrust are invited to attend a networking break. In order to present a great event at an accessible registration rate, we are seeking sponsors at a variety of levels. 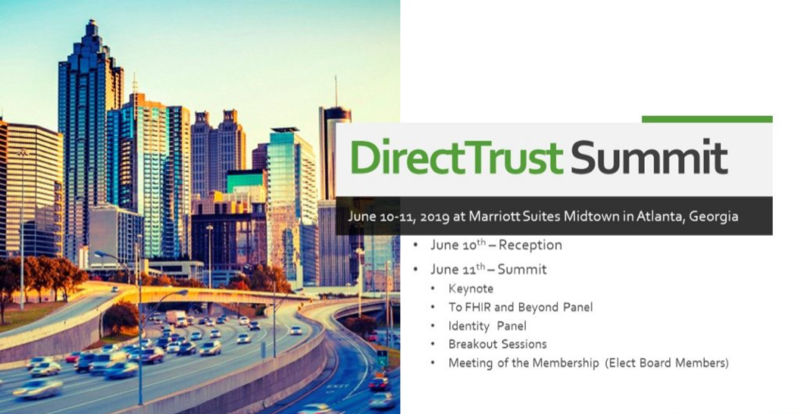 For more information on sponsoring the event, please visit our DirectTrust Summit Sponsorship form and indicate your interest levels of support. Registration fees are non-refundable, but can be substituted. Registrants unable to attend may send a substitute. If the substitute is not a member, the non-member fee will be required. Substitutions must be made in writing to admin@directtrust.org no later than May 31, 2019.